From a statewide field of leading energy researchers, CCST selected Jens T. Birkholzer, PhD, and Jane C.S. 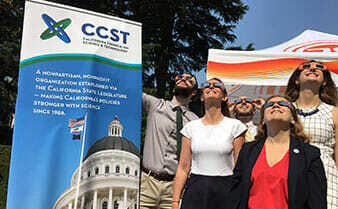 Long, PhD, to serve as co-chairs of the 12-member CCST Report Steering Committee – which supervised 21 Report Authors with expertise spanning hydrogeology and reservoir engineering, risk assessment, public and occupational health, greenhouse gas (GHG) emissions, and energy analysis and economics. Each report chapter was subject to a peer review process by independent experts, while another independent expert served as Report Monitor to oversee the process, ensuring that peer review comments were sufficiently addressed in the final report. An additional Oversight Committee reviewed the entire process, including conflict-of-interest declarations. 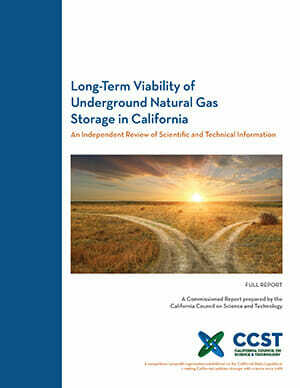 Safety: The risks associated with underground storage (UGS) facilities can be managed, and, with appropriate regulation and safety management, may become comparable to risks in other types of energy facilities found acceptable in California, such as oil refineries and natural gas power plants. At each UGS facility, the State should ensure timely and thorough implementation of the new regulations coming into force in 2018 set by the California Department of Conservation’s Division of Oil, Gas, and Geothermal Resources (DOGGR). Those regulations emphasize new and safer well completions, risk and safety management plans, and requirements for well integrity testing and monitoring. The report recommends that the State go further and require more quantitative risk assessment activities, including consideration of human and organizational factors affecting risk. The State should also implement an independent and mandatory review program to evaluate the effectiveness of these new regulations and the rigor of their application in practice, with opportunity for public comment and public dissemination of the review results. Facility-by-Facility Evaluation: Any industrial operation involves some risk to health, safety, and environment. 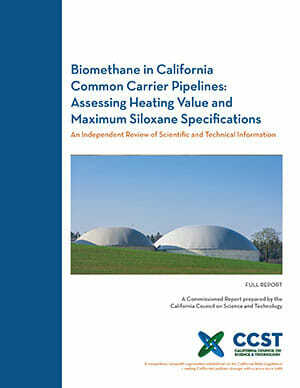 This report assessed various risk-related characteristics across UGS facilities in California, and found a small list of facilities had relatively higher potential risk compared to others. Near-Term Alternatives to UGS: Closing any or all UGS facilities in the near term would involve replacing UGS facilities with new pipelines or natural gas storage capacity, and require very large investments. Such new natural-gas-related infrastructure would bring its own risks and would further obligate the State to the use of natural gas for decades. The risks, costs, and benefits associated with alternatives to UGS storage should be evaluated accordingly. 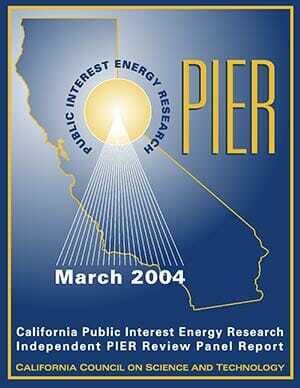 This report is the interim report responding to Senate Bill 1038, requiring that the California Energy Commission (CEC) convene an independent review and critique of the Public Energy Interest Research (PIER) Program. 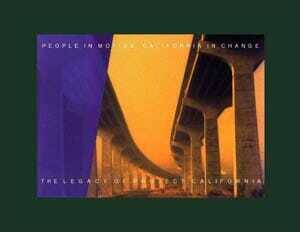 Launched in the summer of 1992, Project California was a visionary effort that brought together leaders in industry, government, labor, and academia to mobilize the unique resources of this state in addressing the challenges of economic restructuring.